After his jaunt in prehistoric times, Bruce Wayne lept forward to the 1600s. He found himself at the base of the same waterfall he'd jumped off while being chased by cavemen, because while he was skipping through time, he was anchored (more or less) in space. It does raise the issue, though, that given the movement of the planets, if you actually did travel in time, the Earth wouldn't be in the same spot anymore. Bruce arrived in the colonial period along with a Cthonic monster. He immedaitely saved a village girl from the beast, and in return she nursed him back to health and gave him the clothes of a dead man. He took on the role of Mordecai, a witch-finder sent from Boston to help Brother Malleus keep the Gotham Colony safe, and managed to display his detective skills despite his amnesia. 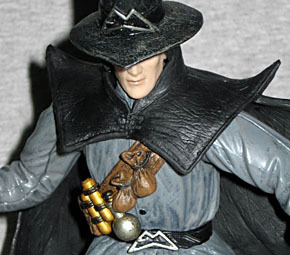 Witch Hunter Batman was sculpted by Mike Locascio from Andy Kubert's character designs. Though the differences between Kubert's designs and the actual art in the comic aren't as drastic on this figure as they were for Prehistoric Batman, they do exist. The most drastic change is the shape of his buckles: in the book they were normal squares, while in the character sketch (and thus this toy) they're all bat-shaped; again, it suggests a longer period of time spent in the time period, if he could fashion his own stylized accoutrements. This time his utility belt is a sash, but it's still stocked with pouches of materials, a few vials, etc. For some reason the sash doesn't continue around his back, though. The figure's clothes are rather baggy, which makes sense since they don't actually belong to Batman (though you'd expect people back then to be smaller, and thus the clothes to be too tight). His cape has a scalloped edge and pointed shoulders, to create that "Batman" feel. 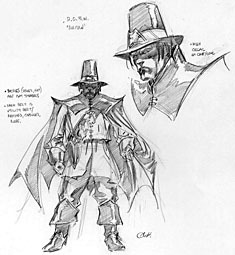 His hatband is a different texture than the rest of the hat, and his boots, gloves and cape are meant to look like leather. He's fairly pre-posed, with his wide legs and accusatory point, but the tall hat keeps him from looking short. 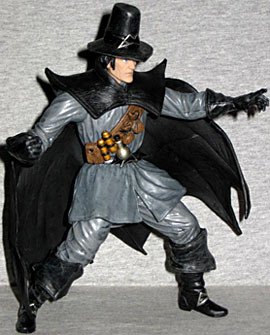 Now, it's important to remember that this isn't just "Puritan Batman" - it's actually Bruce Wayne. Not some Elseworlds version, not an alternate reality, the "real" Bruce Wayne. Therefore, the face on this figure should look the same as the caveman's, but it's a totally different shape. The eyes aren't even painted the same color, which kind of breaks the illusion. 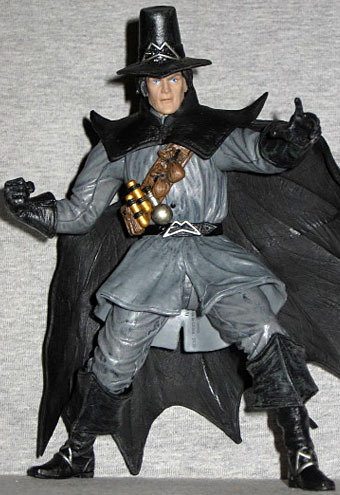 Batman: Witch Hunter does not have very much articulation. The neck is a balljoint, the shoulders are swivel/hinges, and the gloves, hips and boots are swivels. That's it. No elbows, no knees, and of course he's not going on the list of DCD figures that have a waist. His only accessory is an 8¾" wooden staff wrapped with metal bands. It splits in two so you can get it in his hand, but the tab doesn't seem to line up with the hole no matter which way you turn it - I ended up shaving some plastic off to make it fit. Actually, the stick coupled with his pose makes him look like Kung-Fu Pilgrim Batman. Going back to what we said at the outset of the review: if you travelled in time but weren't rooted to the spot, how far away from your departure point would you arrive? It depends. If you were constrained to the Earth's surface, travelling one hour into the future would also move you 1,000 miles west. If your position was tied to our solar system, jumping one minute into the future would put you 1,100 miles into space - if you went forward 4 hours and got very lucky, you might find yourself on the moon instead of stranded in a vacuum. If you were fixed to the center of the Milky Way, in an hour your home planet would be 490,000 miles away, receeding at a rate of 136 miles every second. And if none of that were true, if the Earth, the sun and even our galaxy were moving on without you, journeying 60 minutes into the future would displace you by 872,405 miles, three and a half times the distance of the Earth from the moon. Think about that next time you read a time-travel story.